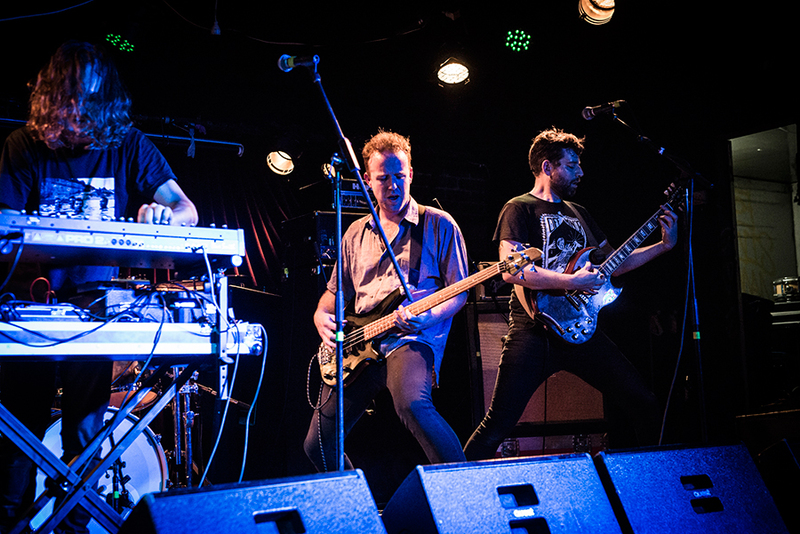 Melbourne’s CASCADES are difficult to pigeonhole by genre beyond ‘heavy’. Almost like a soundtrack for an R-rated Miyazaki film, their songs are bound by themes of humanity against environment. 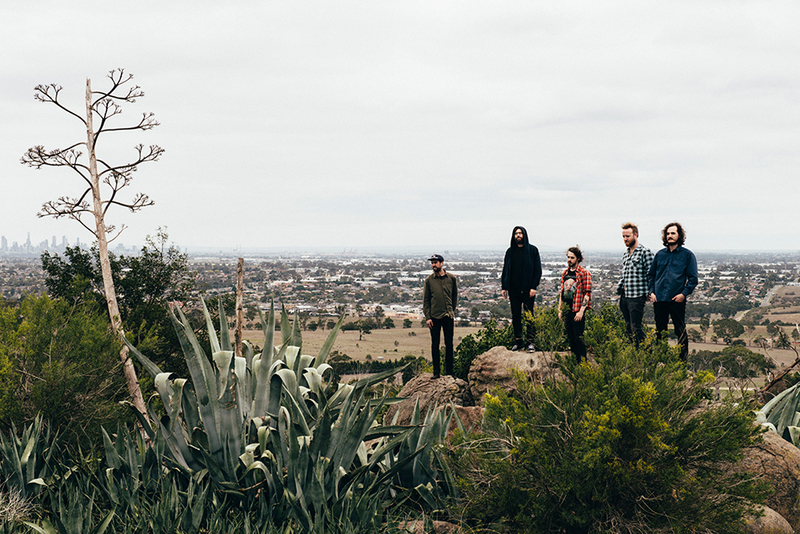 Eighty- percent of the band spent their formative years in Tasmania, playing in some criminally underrated turn-of-the-century bands – the residue of isolation that marks the sound of the best records to come out of the state remains. They’re about to put out their first LP, and will play this weekend’s NEGFEST at the Reverence in Melbourne after making their Sydney debut at the gig’s Sydney iteration last weekend. UB had a yarn with guitarist/singer Liam White. A few years ago Max (bass), Sam Orchard (guitar) and Toby (drums) played in a band together in Hobart, called The Ghost And The Storm Outside. After all relocating to Melbourne over a period of a few years, the three of them started writing together again with the aim of creating something new. Sam Filmer (synths, glockenspiel ) joined shortly afterwards, and the band started working on incorporating synthesisers into its songwriting. I joined last, and we started all writing together. We spent a lot of time writing and throwing parts out, and refining the songs, which ended up being around a year of writing as a five-piece before we played a show. Sam Filmer grew up in Victoria and is the only member of the band who didn’t grow up in Tasmania. I feel for him, being stuck with four of us and a million in-jokes about Upper Blessington West and Phil Maney. What’s the story with the LP? Who worked on it? How long did it take to make? Have you had help from a label? After a year or so of working on these songs we had eventually gotten them to a point where we thought they were working well together. We’d originally written them a lot faster, but over a six-month period we played around with tempos and dynamics a lot and found the right tempo for each of the songs, which meant many of them ended up about 30% slower. I think that helps give the ideas some space and to not feel like we’re rushing. The songs are all based around various failings and challenges we face as a society in 2017, with an eye to the future. There are themes about the natural world and human beings’ deleterious effect on it, but we also point the finger at ourselves and our own fallibilities. The LP is about being human, with all its inconsistencies, destructive tendencies, greed, and self-interest, and our appreciation and love for the natural world. We recorded the LP with Joel Taylor at The Black Lodge. Joel was fantastic to work with. It felt like he really understood where the band was coming from, and helped us to get the performances we wanted to capture. It was a very organic recording experience – we tracked the songs together in a big room, with guitars in a smaller room with the door open off to the side so we could see each other and work together. As a result, all of the basics were tracked live. We tracked most of the synth afterwards, running through an enormous stack of amplifiers. It sounded like the world was ending. Joel mixed the record and it was mastered at Audiosiege by Brad Boatright. We paid for everything ourselves, including LPs, which we are self-releasing. Art As Catharsis is helping us out with our digital release. We’re beginning to write for LP2 and hopefully we can look at recording something late in 2017. We’re looking at turning the thematic lens inward for this one. Who made the video for “Cold Bloom”? Where was it shot? Our own Sam Orchard is a great cinematographer and editor. Sam and Toby came up with the concept and direction for the clip, and we used file footage and shot the rest ourselves, driving around rural and suburban Victoria. Sam did such a great job visually depicting the themes of the video – resource depletion, greed, ‘progress’, and a reference in there to Earth Overshoot Day, all of which the song talks about. We’re really happy with how the video turned out. We have another video in the works for “Whitewater”, which will have a different look and feel. It’s looking great. A few CASCADES members cut their chops in some pretty crucial turn-of-the-century Tassie bands. Who played in what, and what happened to those bands? Yeah for sure, those bands were active a long time ago now, close to 10 years. Sam Orchard, Toby and Max played in The Ghost And The Storm Outside, which was a great crust / prog band. I played in The Scandal, which has been mostly inactive since 2008. I did a few other projects for a while too; Following Sea, Jamie Hay, Future Envy. Sam Filmer played in Em Vécue Aquieu and a number of improvisational projects including Melbourne Drone Orchestra. Those projects are (mostly) in the past for us now though, and while they’re an important part of our story and were musically incredibly important for us, now we’re focused on the present and future. CASCADES play NEGFEST Melbourne on Saturday, May 13, at The Reverence Hotel w/ Encircling Sea, YLVA, Hope Drone, Adrift for Days, In Trenches and No Haven.